Stainless Steel Flexible Conduit is known for its corrosion-resistance, high strength durability and non-magnetic properties. 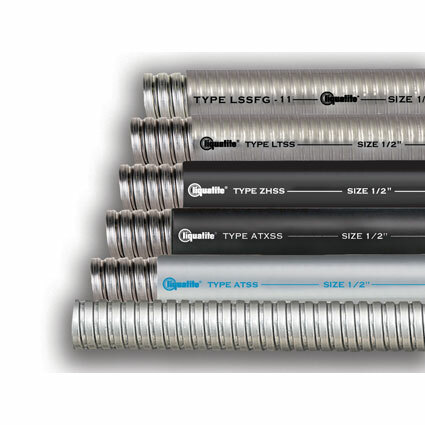 This line of conduits is available in five varieties of jacketed stainless steel flexible conduits and one unjacketed conduit. These types provide a broad array of variations dedicated to specific applications, such as Food Processing, Wastewater Treatment Facilities, Oil & Gas Refineries, Ship Building, Steel Mills, Power Plants, and Defense. Specialty product features include, but are not limited to, Food Grade/NSF Certified, Industrial Grade, Halogen-Free, Low Fire Hazard, and Extreme High/Low Temperature varieties. Now available with halogen-free jacketing (Type ZHLA) ideal for field installation in confined public areas, as well as extreme high/low temperature (Type ATLA) with both UL and CSA listings. Colors can be blended to meet any request and are available in many other types. LTFG is a Food Grade flexible liquid-tight steel conduit that is a Certified Component for NSF/ANSI 169 special purpose food equipment or devices. It provides an FDA approved jacketing, flexible protective wiring raceway, working temperatures of -20°C to +60°C, smooth exterior for easy wash down, and doesn’t promote bacteria growth.